Japanese Episode AG 057: "Patchiiru ga Ippai! Shiawase Sagashite Yama no Kanata ni!!" American Episode 329: "Going for a Spinda"
Satoshi has his fourth Houen Gym Badge, so the gang wonders where they should go next. Takeshi says that they should pass through Touka City on the way to Hiwamaki City, so it is decided to challenge Senri, the Touka City Gym Leader and father of both Haruka and Masato. On the way, the gang comes across a Patcheel, a panda-like pokemon with various spots on its body. The gang is soon approached by a woman who is searching for a Patcheel with a specific configuration of spots on its body. Satoshi and his friends decide to help, so the search for the Patcheel begins! After picking their way through a variety of different Patcheel, the gang finds the pokemon that the woman, Claire, was looking for. 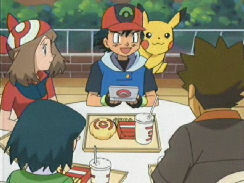 However, the Rocket-Dan appear and try to kidnap Claire's pokemon! The trio is quickly defeated, but Patcheel is separated from the group during the battle. Claire's search for her pokemon begins again, this time leading the gang to the top of a mountain. There, among a field of wildflowers, Claire finds the Patcheel she was looking for once more. Suddenly, a man by the name of Cain arrives and reveals himself to be Clarie's fiancé! The Patcheel that Claire was looking for had actually belonged to Cain, meaning that Claire was simply looking over it until he could reclaim his pokemon. The Rocket-Dan make a second attempt to steal all the Patcheel, but Takeshi and Satoshi work together to send them packing. Now that Claire's troubles have been solved, Satoshi and the gang begin their journey to Touka City. Houen just keeps breaking the mold, doesn't it? I mean, I remember the days when the episode right after a Gym Battle would be unusually bad (perfect example: "Whichever Way the Wind Blows"), but in Houen, the post-Gym episodes are usually fun and entertaining. 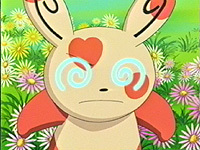 This episode continues that Houen trend by giving us one of many love-themed episodes in the Advanced Generation series, this time involving the pokemon Patcheel. The anime didn't forget the fact that the pokemon sport all sorts of patterns in the video games and created an interesting episode to showcase this fact accordingly. The dub doesn't have any surprises, really. We get the first Badge Case edit of the new season, but other than that, it's the same old same old. The first two seconds are cut from the episode. Apparently, as of this episode, the Badge Case edit ceases to be a Kids' WB!-only phenomenon and finds its way to the rest of the world. From now on, Canada, the UK, Australia, and every other country that gets the English dub will have to put up with the red rectangle that we Americans have had to put up with all this time. A second is cut right before the theme song starts. Then, two seconds are cut from the scene right after the title screen. Team Rocket: "When it comes to grabbin' Spinda, looks like we win-da!" Sorry, but that was just too lame to ignore.